Honda UK is marking the silver anniversary of Type R and Fireblade with a dynamic duo of exciting unveils at the 2017 Goodwood Festival of Speed. The much-anticipated next generation Civic Type R and a special livery Fireblade will both make their UK debut at Britain’s unofficial motor show in the Sussex countryside. 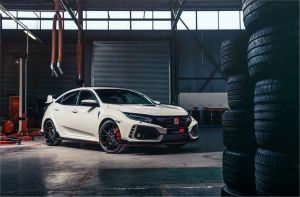 Ahead of arriving into retail forecourts in July, the next generation Civic Type R will be both on the Honda stand and racing up the legendary hill climb. Piloted by our very own pair of triple-champion British Touring Car Championship drivers, Matt Neal and Gordon ‘Flash’ Shedden; the fastest front-wheel-drive car around the Nurburgring will also be driven by another very special guest driver on the Saturday afternoon. First seen in 1992 on the NSX and produced only for the Japanese market, Honda’s Type R versions were originally designed for the racetrack with an emphasis on minimizing weight and maximizing performance potential. Since then, the famed Type R badge has been seen on the Integra, the Accord and most recently the Civic. Leading Honda’s two-wheeled charge up the famed Goodwood tarmac will be a Dare to be Different branded CBR1000RR Fireblade, ridden by Honda ambassador, former Honda BSB racer and Isle of Man female lap record holder, Jenny Tinmouth. Jenny is a partner of Dare to be Different – an initiative fronted by former F1 driver, Susie Wolff, aimed at driving female opportunities within motorsport. Joining the Dare to be Different Fireblade will be a whole host of very special Fireblades from throughout the years, helping celebrate the 25th anniversary of Honda’s iconic sports bike. Starting from £30,995 or just £299 a month on PCP, the British-built Civic Type R is the peak of performance for Honda’s Type R range. Featuring an optimised and refined version of the 2.0-litre VTEC TURBO of the previous generation Civic Type R, which was billed as the most extreme and high performing engine ever to bear the famed red Type R badge, the new engine delivers 320PS with peak torque of 400Nm. Honda’s new generation of Fireblade is available in three guises: the CBR1000RR offers a 14% power to weight ratio improvement over the outgoing model and features Honda Selectable Torque Control. An SP version takes Fireblade’s Total Control concept to the next level, with the addition of semi-active Ohlins Electronic Control suspension, quickshifter and downshift assist and riding mode select system. At the top of the tree is a strictly limited Fireblade SP2 – a road-legal, homologation special, complete with a raft of MotoGP-inspired technology. Goodwood Festival of Speed takes place 29 June to 2 July. Visitors to the Honda stand can see the entire four wheeled range, a selection of bikes and take part in exciting challenges to win prizes. For more information on Civic Type R, Fireblade and the entire Honda range of cars, motorcycles and power products, visit honda.co.uk.